A message to take some time out, be reclusive and seek some solitude comes to us with this cute, whimsical Oracle deck. Happy Valentines week folks! 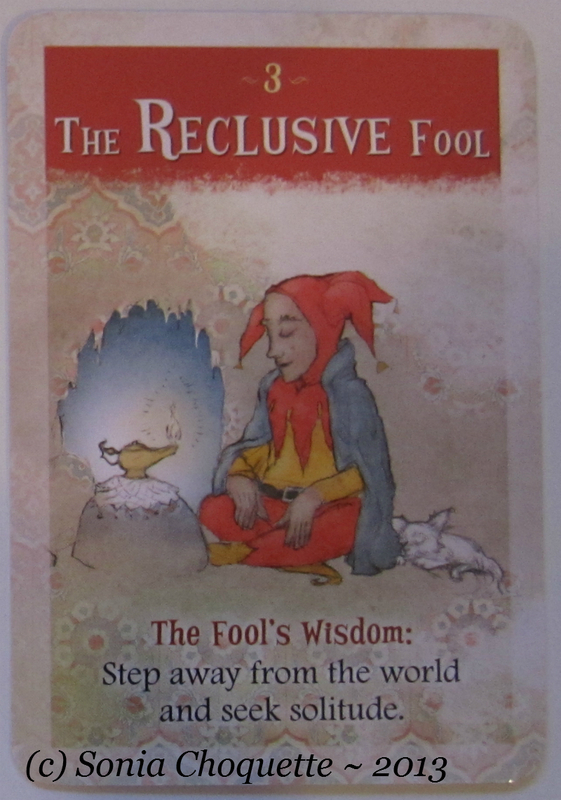 I’m getting to love this little deck with its simple, direct and gentle way to convey its messages. We all need time “away from the game”. I saw a comment via Twitter the other day that the best self-indulgent thing we can do for ourselves, is take a long hot bubble bath. Ha, I wish! I grab a shower in between doing this or that with the kids around my ankles or asleep in their cots. However, this deck makes a good point (p8, 3rd paragraph) that we risk being over-whelmed by the doubts and fears of the outer world, losing your confidence and direction. It suggests that you take a temporary time out and go inward, create the separation from the things that grind us, to create the space that our inner guidance needs to work. If you’re feeling guilty about taking this personal time out, I have to ask why? No time to run that bath? The kids need this, the dog needs this? There’s the shopping to get done… Oh, I have a list as long as your leg for excuses for not looking after yourself. I know this list well; it’s my excuses list too! And that’s exactly what it is. It’s a list of excuses to not look after yourself. If you’re not going to look after yourself, who will? How can you help those around you, whom you love, if you won’t take one half an hour out for yourself? Tuck the kids up into bed, run the bath whilst you empty the dishwasher or make the lunches, but take that time out to find your inner self and seek that bit of solitude, that little bit of reclusive time that is totally ours. Lovely post and so recognizable!